We have established the following policies for the boogie to make it as safe as it can be, and make our cooperation with the city of Wildwood and Cape May Airport as smooth as possible. All fun jumpers must have at least a “C” license by August 1. If you don’t have it by then, we will refund your registration (minus $5 processing fee) and offer your spot to the next person on the waiting list. Cancellations and refunds are allowed up to 1 week prior to the boogie; $5 processing fee applies to any refunds. Any cancellations after August 2 are not refundable. Registration is not transferable. We will keep a waiting list, and in case of a cancellation, a spot will be offered to the next person on the waiting list. You can’t pick who takes your spot. 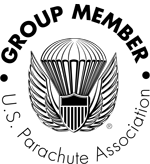 Wingsuiters are cool and are welcome to register. Wingsuiters must have a minimum of 500 jumps, and 200 wingsuit jumps. Numbers aren’t everything though! If you have fewer jumps but believe that you have enough experience to safely jump over the beach, email us at jump@skydivecrosskeys.com for an application and we will review your case individually. To keep our event as safe as possible, any wingsuit jumps made at the boogie have to be supervised by a designated Wingsuiter-In-Charge (Jim Bilodeau). Anyone who is planning on wingsuiting MUST purchase the Wingsuit Registration slot; it’s the same price - it just lets us see how many wingsuiters registered. Every beach jump has to be treated as a demo jump. There are obstacles, air traffic, and spectators in the area. Your primary goal is to have a safe landing in the designated landing area; NOT to impress the audience with your swoop. Detailed pattern and landing area briefing will be given prior to the event. Jump ticket price is $25, cash or credit. No discounts, sorry! Cross Keys block jumps can not be used in Wildwood. Carpeted packing tents will be set up on the beach. Packers will be available; pack jobs are $10 cash. Packing at the airport is not allowed by airport management. Rental gear or rigging services will not be offered at this boogie. What you need to bring: (1) a USPA card; (2) an up-to-date logbook; (3) a reserve card; (4) a flotation device. You have to be current - we won’t have instructors available for recurrency jumps. Smoking isn’t allowed anywhere on the beach. Please keep the beach clean and don’t litter. Anyone not following the safety policies, landing area policies, USPA regulations or requests of the S&TA may be denied further participation in the boogie without a refund. We will update this often as we get closer to the event. We will have either a Caravan or a Twin Otter for the boogie, going to 13,500’ and dedicated to fun jumpers only. Tandems will be using a Cessna 182. We’ll be jumping from 7 am till sunset on Friday, Saturday & Sunday, August 9-11. Shuttles will be going from the boardwalk on Spicer Ave to Cape May Airport every 20-30 minutes. If you miss your shuttle, no jump ticket refunds are given. 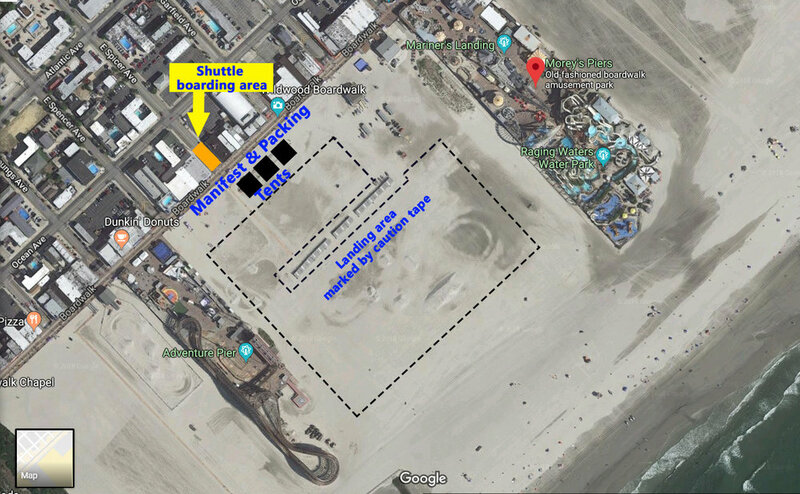 We will have a roped off landing area about 1000’ x 1000’ between the Adventure Pier and Mariner’s Pier, between the boardwalk and the bleachers. Specific landing area policies will be announced closer to the event. Hop & pops and high pulls? We are in the process of coordinating with Air Traffic Control and will update this info as soon as we have it. We recommend booking your hotel or AirBnB early. Camping is unfortunately not allowed on the beach, but there are RV/tent campgrounds in the area. Check out Acorn Campground (7 miles away) and Avalon Campground (15 miles away). Yes, we will be doing tandem jumps from 10,500’ out of the Cessna 182. Feel free to bring friends! Advance booking is required at this link. Wildwood is a super fun town and there are a lot of restaurants and bars in walking distance. We are working on some special plans too! What else is there to do in Wildwood? Beach, water parks, amusement rides, helicopter tours, there’s tons of fun to be had. The city is both family friendly and skydiver friendly, and very welcoming. You will love it!